In the 1880s Pinnacle Springs was perhaps the most popular health and recreational resort in central Arkansas. In a summer tradition that lasted for many years hundreds of people would travel by buggy, hack, horseback and foot to drink and bath in the healing waters emerging from the crevice in the bluff face bordering the North Fork of Cadron Creek. Hotels, boarding homes and bath houses were filled to capacity and dance halls, a skating rink and a saloon amused the crowds that descended upon the town each season. Today no homes or businesses remain. Where once lovers walked and the ill and infirm bathed there is now a deep forest offering little evidence of prior occupancy. 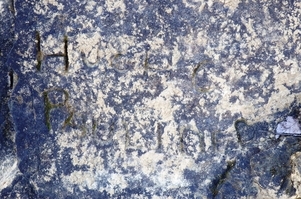 Yet amongst the rock crevices and steep bluffs relics of another age can still be found -- most amazingly, the inscription of hundreds of names, dates and initials carved into the bluffs and boulders that once were at the center of the resort. The story of Pinnacle Springs begins and ends with the family of William W. Martin whose father purchased a large tract of land near Bee Branch in 1848. In 1861, William, the second oldest son of nine children, joined the Confederate Army rising to rank of captain with the Quitman Rifles in the 10th Arkansas Regiment. Upon his return home after the war Captain Martin moved to nearby Springfield where he went into a variety of businesses with family and friends, but perhaps none as profitable as the mercantile stores he established with his brothers in Springfield, Conway and the surrounding communities. Later as mayor of Conway and founder and president of the Faulkner County Bank Captain Martin used his money, power and influence to support many civic pursuits throughout Faulkner County. Captain Martin also owned a 1,500 acre farm with his brother Jesse E. Martin called “Cattern Cove Farm" that included over 400 acres of prime bottom land lying within the Cadron Creek watershed. The farm supported 300 head of cattle, over 150 head of hogs, and 100 or more sheep at a time. In the summer of 1880 on a nearby tract of farmland owned by brother James, a cow herder named Jeff Collier was tending to cattle on the open fields atop Batesville Mountain when he was taken with thirst. Riding his horse along the crest of the bluff overlooking Cadron Creek he looked down below and saw a spring emerging from a deep cleft at the base of the bluff. He dismounted his horse and scrambled down the side of the bluff where a small pool of water had collected and dropping to his knees he began to drink from the pool. He immediately noticed the water had a strange taste (Wilbanks, 1986). When Collier returned to Springfield he reported his discovery to James who then relayed the message to William and the remaining family. Upon confirmation of the spring's peculiar taste and safety and finding that the water possessed a unique chemical signature rich in iron and magnesium Captain Martin and his family began to promote the spring as the centerpiece of a large health resort. And indeed, within a few years Pinnacle Springs -- named after a 50+ foot standing sentinel of rock a few thousand feet downstream -- would rival many of its larger competitors in the state in its popularity. Its demise would come just as quickly. In the spring of 1881 James Martin held an inauguration ceremony at the site and threw the area open for development. 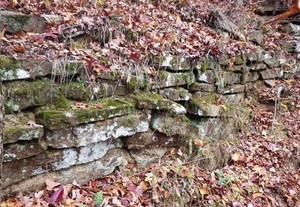 Articles of Incorporation of the Pinnacle Springs Land Company were filed and capital stock of $25,000 was raised through the issue of 1,000 shares at $25 per share -- mostly to close family members from nearby Conway and Springfield. William served as the overseer for the development. Considered one of Conway's "financial elite" William had adequate assets and connections to draw upon in promoting the development as he was the principal owner in "Martin and Harton", one of the best general merchandise stores in Conway with over 7000 square feet of retail space offering clothing, home accessories, groceries -- and even farm implements. The Martin family conveyed 360 acres to the Pinnacle Springs Land Company by quitclaim deed whereupon James divided the town area into three districts -- a business district, a residential district and a two-acre park or reservation owned by William lying on the edge of the bluff from which the spring emerged (Glover, 1965). James erected one of the first homes in the new town and together with his brother William began building the first hotel, the Pinnacle House, a fine two-story hotel of 40 rooms. William also built a bathhouse north of the spring that he furnished with both hot and cold water. Another brother, Jess Martin erected the first store. A local newspaper The Pinnacle Springs Ledger was launched later that summer by Valney Jamison and with "the power of the pen" press releases and promotional brochures were written and widely distributed praising the virtues of the rich farmland and healthy living to be found at Pinnacle Springs. The impact of these promotions became quickly evident as long lines of wagons were soon fording the creek each day with newcomers, lumber and supplies. The Log Cabin Democrat reported in its Centennial Edition that Pinnacle Springs "was founded on a press agent's brochure that was sent broadside into surrounding states" extolling the virtues of Pinnacle Springs' health-giving water. 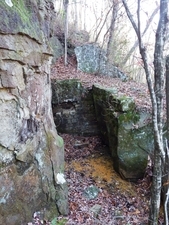 The unusual taste of the water from Pinnacle Spring was derived mostly from a unique combination of minerals and gases. Carbonate of iron, manganese and chlorine are the principal minerals within the water but it was the abundance of glairine, a soft amorphous greasy deposit of slime and mucus of bacterial and vegetative origin that was thought to give the waters their unusual curative and invigorating properties (Burch, 1887). According to testimonials at the time the spring water was particularly helpful in treating bronchitis, tuberculosis, dropsy, dyspepsia, chronic sore eyes, diabetes, and all diseases of the kidneys. The spring water also brought relief to visitors suffering from gastritis and liver disease. Over a dozen more springs with reputed healing and restorative properties were later identified in the vicinity (Goodspeed, 1890) and trails and sidewalks lead from the hotels and city to many of the more popular springs which were named by the proprietors of the various bath houses. Within a year nearly 300 people had moved to Pinnacle Springs and the Pinnacle Hotel was "crowded with visitors". Hammers could be heard day and night with as many as a dozen homes under construction at any one time, and unimproved lots were selling for five to six times their original value. The town now had a school, a church, and a post office and businesses and lodging houses were doing a thriving business as visitors crowded the grand promenade in the city park to enjoy the views overlooking Cadron Creek. In April 1882 the Arkansas Gazette reported that work had begun in haste on a second hotel with completion set for the first of June. The Grand Central hotel, a large 84 x 64 feet two-story frame hotel with wraparound porches encircling the lower and upper stories was built to the east of the city park. The Grand Central, often commonly known as the Park House or the Palace Hotel, was operated by W. J. Dodson a Methodist preacher whose "labor and exposure...were too much for his feeble constitution" and who found himself inflicted with a number of ailments -- deafness, bronchitis, and nervous prostration. The ailing Reverend Dodson moved to Pinnacle Springs to manage the hotel and recover from his infirmities so that he could "return to the active ministry". That day never came. The man who sought the healing mineral spring water offered at Pinnacle Springs would later be stricken with typhoid fever -- acquired from a well in Altus, Arkansas. The Reverend passed away on April 25, 1886. When spring rains threatened some of the improvements near the banks of Cadron Creek the post office was moved to the top of the ridge south of the park where it was more accessible to the growing community. 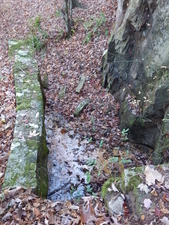 The Cook family placed a series of large flag-stone steps leading down the steep hillside from the city park to the main spring which was piped so that the water gushed forth into a 7000 plus gallon reservoir impounded against the bluff walls by thick stacked rock masonry that stood over eight feet high in places. The reservoir is reported to have been 70 feet long and 20 feet wide, covered over by a roof and surrounded by a flagstone floor. Following the natural contours of the landscape a bathhouse snaked along the bottom of the bluff line below the spring and contained 9 baths, 2 showers, 2 vapor baths, dressing rooms and ladies and gents' parlor. There was also a portico that was constructed to protect those visiting the spring or donning their swim suits to enjoy the long "lake" of Cadron Creek. A dance hall -- the "Grotto" -- was constructed in a small nearby box canyon that opened to the creek and was surrounded on three sides by towering rock walls. On June 30, 1882 Pinnacle Springs celebrated its one-year anniversary with day-long festivities and events highlighted by the official opening of the Park Hotel. An anvil salute at 10 o'clock in the morning ushered in a large crowd from the neighboring towns and communities to enjoy "political and temperance speeches, music and dancing, swing­ing and boat riding". The evening ended with a grand ball at the Park Hotel where local dignitaries danced late into the night to the music furnished by the Conway String Band. As the event unfolded Pinnacle Springs celebrated its first year with two grand hotels, four boarding houses, seven stores, 325 citizens, and seventy five visitors. 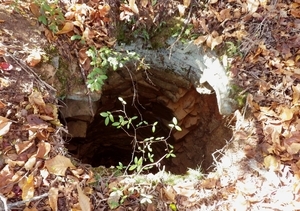 When Dr. Juan H. Wright, the noted analytical chemist of St. Louis, visited many of the springs along the Fort Smith road in 1882 the Arkansas Gazette reported that "he was much pleased that Pinnacle Springs has in one year grown to be a large town; its prospects are brilliant, the number of patients very flattering and the hotels will be open all winter." Indeed, times were good and visitors seemed plentiful as brochures and flyers were sent out to prospective clients and investors in Texas, Louisiana and Tennessee. Pinnacle Springs was particularly appealing to residents living in the Arkansas River Valley because it was "free of malarial influences." Conway was built on a large marsh and during the spring the streets were veritable quagmires and each summer swarms of mosquitoes infested the place and often did not disappear until well into winter. Pinnacle Springs offered not only an escape from the heat, humidity and mosquitoes of the lowland it also possessed all the pleasures of a recreational resort – boating, bathing, fishing, hunting, swimming, etc. But, perhaps more importantly, Pinnacle Springs lacked the social formalities of the “more refined" spas: at Pinnacle Springs ladies and gentlemen in their "revealing and temptatious" suits bathed and swam together. Several hack lines operated from the river port at Conway to serve the needs of visitors and carry goods to Pinnacle Springs but the ford across Cadron Creek just upstream of Pinnacle Springs could only be used safely in late summer and fall. Thus, to offer safe passage during the spring a ferry large enough to accommodate a team of horses and a wagon was located downstream of the ford at the head of "Spring Lake" (Log Cabin Democrat, 1973). It was a simple ferry -- hand-operated, using ropes and pulley wheels -- but with safe passage now available year around the town grew at an even faster clip. A sawmill and shingle mill were built north of the town and a cotton gin and grist mill were built to the south. Other improvements included the opening of another dry goods store, a drugstore, shoe shop, blacksmith shop and a brickyard. And to serve the recreational and restorative aspirations endowed upon Pinnacle Springs there was also a skating rink, 10-pin alley, pool hall and billiard room, a dozen bathhouses and a saloon (Junas, 1979)..
On the night of January 10, 1883, a group of masked men road up to Lindsay’s house with the intention of making him leave the area once and for all (Barnes, 2004). When the masked men began firing their guns aimlessly into the air Lindsay and a group of his neighbors escaped out a back door. As they were being pursued by the vigilantes, they turned and fired and one masked man, later identified as Harvey Holland, fell dead. Lindsey and his party traveled all through the night by foot through the mud and muck of Cadron Bottoms before arriving in Conway worn out, frightened to death and seeking help. Lindsey was promptly arrested, sentenced to life and sent to state prison for the death of Harvey Holland. As for the masked men whose raid precipitated the death of Holland: warrants were secured for the arrest of three people but when the sheriff's deputy took his posse into the area the men for whom he had writs had left Pinnacle Springs for the purpose of avoiding arrest. Race relations became more tense in the fall 1890 when white and black residents quarreled over the title to another tract of government homestead land. A white man named James Cook of Pinnacle Springs filed an ejection suit in circuit court to remove a black man named Jackson from some of the property both men claimed. After a deputy sheriff removed Jackson and Cook took possession of the homestead, eleven black men and one woman showed up at his doorstep and shot Cook, though not fatally. Authorities promptly arrested the offending blacks, but the neighborhood was much astir over the incident. Shortly thereafter, Thomas Riley, a black man from Pinnacle Springs, wrote to the American Colonization Society for information about how to emigrate to Africa. Thomas and many of his African American neighbors in the area formed an emigration club and began making contributions in order to gain passage to Africa. Forty-eight applicants from northern Faulkner County sought passage; but sadly, none were able to secure passage on the departing ships and they certainly weren't made to feel welcomed at Pinnacle Springs. Pinnacle Springs was in no position to exclude visitors based upon the color of their skin. Beginning with a prolonged drought in the summer of 1881 farmers in the Cadron watershed began to face a series of natural disasters. In 1982 heavy rains and flooding delayed planting and washed away improvements at Pinnacle Springs and throughout the rest of the 1880s cold wet weather, unwanted rains and extended dry spells shook the community's confidence further. Even as railroad fever was racing through the area with rumors of a Springfield and Southern railway passing through the community, by the mid-1880s it was evident that Pinnacle Springs had reached a plateau -- limited by space and access Pinnacle Springs could grow no more. Moreover, the resort was placing a significant burden on the Martin family resources and distracting William Martin from his far larger civic goal of riding central Arkansas of its saloons. William W. Martin was a strict prohibitionist and was chosen for the chairmanship of the state temperance committee -- a role he savored. First as deputy sheriff and then as one of the Springfield's leading citizens Martin cleansed the town of all its saloons and offered support and provision for the town's first school and churches. In 1885 Martin moved to Conway, a town known as being "tough" and "under the control of the whiskey element" and immediately went about cleaning up the town. Upon opening a mercantile in Conway, which William would later sell to his brothers, he set upon eliminating all the saloons from the city by lobbying local people and businesses for restrictive ordnances. Within three years the job was done -- Conway was free of any saloons and an ordinance was established in which all children had to be off the street after 9pm. This led the way for Conway to become the home of two important theistic colleges and for Martin to become mayor of Conway, a post he held from 1890 to 1905. Martin also took his prohibitionist crusade to Pinnacle Springs -- a health resort premised on one's freedom to indulge in life's pleasures, imbibe in restorative spirits and lounge for one's recovery. Soon after being elected president of the recently organized Young Men’s Christian Association of Conway, William was able to enact a restrictive ordinance in Pinnacle Springs similar to those he enacted in Conway forbidding the sale of alcohol within the town. However in William’s endeavors to eliminate alcohol at Pinnacle Springs wasn’t nearly as effective: Amy Julian simply moved his saloon across the creek to the east side of the Cadron where is was still readily accessible as it was just a few hundred feet away from the center of town and still close to the ferry landing. "Pinnacle Springs offers many attractions to those wishing to make their homes in a college community for the purpose of giving their children the best educational advantages. Pinnacle Springs is free from saloons, theaters and other pla­ces so alluring and pernicious." The hotel at Pinnacle Springs was still open through 1888 with J.W. Austin and W.B. Crosby serving as the proprietors but business was slow and vacancies high. Pinnacle Springs no longer needed a hotel, so it was re-purposed to serve as a boarding school and the Arkansas Christian College opened its doors on September 2, 1889 under the guidance and management of its president William Moseley and his wife. Nine months later in June 1890 the first class graduated. Unfortunately, no other class would graduate as the college closed soon thereafter citing a lack of good transportation to the school as underlying its lack of success -- the rough four-hour trip by hack from Conway was simply too big of a deterrent to prospective students and their families. Pinnacle Springs quickly fell into disrepute with the Martin's abandonment, racial strife and the closure of Arkansas Christina College. After 1890 the town quickly slid into a depression that was punctuated by the near wholesale abandonment of the community with the Panic of 1893. After the post office closed in 1891 the dying resort with its empty homes and aging improvements became a gathering point for "immoral people". Eller Little, a resident of the commun­ity stated, "The decent people had to leave on this account and settled in the nearby communities of Guy, Damascus, and Martinville." With incorrigibles and scoundrels and criminals finding sanctuary and relaxation in Pinnacle Springs the character of the town changed. On April 10, 1891 James P. Paxton, a law enforcement officer from Nebraska, was shot dead in Pinnacle Springs as he was attempting to serve an arrest warrant for a man wanted in connection with selling mortgaged property. When Paxton commanded the man to surrender, the man responded by shooting Paxton in the face, killing him instantly. Mat. S. Good, the man who shot and killed James P. Paxton, was acquitted by a jury of his peers and with the applause of his friends. This cemented Pinnacle Springs' reputation as a place to avoid -- and it was. In 1932 the Log Cabin Democrat of Conway reported that J.I. Summers was chosen president of the Pinnacle Springs Resort Company that was formed to revive Pinnacle Springs as a summer resort by first improving the road from Highway 65 to the springs and then clearing of the entire 110 acres of the land so as to erect quarters, cottages and improve the swimming facilities. But Pinnacle Springs had always been "popu­lated with a class of people who were carried away more by enthusiasm than by fact" and no other evidence has come to light suggesting that such improvements were ever made. In 1936 the Methodist Church at Pinnacle Springs, the last occupied structure at Pinnacle Springs was disbanded. Today all traces of the many buildings that once housed hundreds of people have disappeared -- even their foundation stones have been carried off or buried. A memorial tabernacle erected in the 1950s has been taken from the site and the springs have withered, waned and with but two or three exceptions no longer flow. 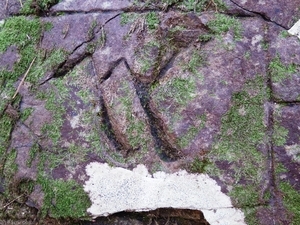 All that remains are the many names and dates carved into the rock faces -- marks of newly married couples who came to this area to spend their honeymoon, of invalids seeking restoration and of young scouts with more youthful energy than sense.